Previous Club: East Perth (WAFL), Fremantle rookie list 1997. Awards: Best first year player 1999. One of the most loved Magpies of the past ten years. Rupert Betheras became a Collingwood cult figure upon his debut in round three of 1999 against the West Coast Eagles at Victoria Park. With the number 49 jumper, the name ‘Rupert’ and his robust and hard hitting style of play, Betheras quickly won over the Magpie hearts. Betheras had a position on the Fremantle Dockers rookie list in 1997, and trained with the Magpies in the summer of 1997-1998. Then Coach Tony Shaw told Betheras that there were no guarantees that he would gain a position on the senior list, and took up a position on the Pies supplementary list for season 1998. Betheras was a good player for the reserves in 1998, scoring the best and fairest for his troubles. Then, in the 1998 national draft, Betheras was chosen by Collingwood at pick 76, and played his first game for the club in round three in the second last game at Victoria Park. It was the first of his 16 games for the season. He played the next two weeks on the ball, before he was dropped for round six against North Melbourne. He then returned a fitter and more controlled player in round 10 against the Swans – the day that Tony Lockett broke the goal kicking record. Betheras played all but one game after that, missing out on the clash against West Coast in round 18 with a back injury. At the seasons end, Betheras was rewarded by the club with the award for being the best first year player. In 2000, Betheras continued where he left off in 1999, playing every game of the season and winning a lot of the ball across half back and the midfield. He was a key figure in the first five weeks of the season, when the Pies won their first five games. Despite Collingwood losing many games mid season, Betheras was one player to hold his head high, continuing to win the ball around the pack. He led the club for handballs for the season. Thea year, 2001, was an indifferent season for Betheras, who had some good games marked by some stints in the VFL. He played 14 games for the season, including a great one against the West Coast in round 12, where he dominated across half back in the side’s victory. He was dropped for round 19 and didn’t return. Despite all this, ‘Rupe’ came back in 2002 with a vengeance, playing with a new lease of life across half forward – often playing as the third tall. As he always did, Betheras rose to the occasion, using his strength and robust pace to mow down opponents and lock the ball inside the forward fifty. Betheras saved his best football for the big matches – such as round eight against Brisbane, where he scored three goals to be one of the best on the ground. Then, only two weeks after being dropped, ‘Rupe’ played the game of his life against Port Adelaide at AMMI Stadium in the first qualifying final of 2002. Betheras lit the Magpies fuse in the first term with two great goals, and then winning a lot of the ball around the midfield to be one of the side’s best. Two weeks later against the Crows at the MCG, Betheras again stoked the Pies fire, with two more terrific goals – his best coming from the fifty metre line at the city end on the wrong side for a right footer. Hemmed in on the boundary line, Betheras, on the run, rammed home a beauty to see the Pies to victory. The chant of ‘Roop, Roop, Roop, Roop’ echoed around the famous old ground, as Betheras engineered a marvellous victory. Then, in the Grand Final against the Lions, Betheras starred in the first half, hitting the Lions bodies hard and locking the ball inside the 50. However, it was not enough, as the Pies went down in an epic by nine points. 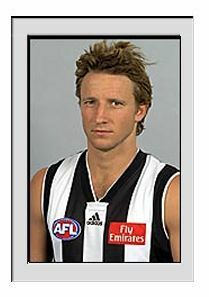 Year 2003 was a sour season for Rupe, who struggled with poor form. After beginning the season in the side against Richmond in round one, Betheras was dropped for round three against the Cats, and wasn’t seen until round six against the Swans – where he scored a goal in the team’s loss. He was again dropped, and stayed in the VFL until round 13 against the Bulldogs – where he banged home three goals to again spark a win. Betheras was consistent for the next few weeks until round 18 against Geelong, where he had a quiet game – and was dropped for the next week. Despite being named an emergency for the first two finals, Betheras could not squeeze his way into the side, and was delisted at the seasons end – sparking angry reactions from many Magpie supporters. He is a true Collingwood cult hero.